Growing construction market, rising IT infrastructure & spending, expansion of Kuwait airport, construction of three new cities, along with rising security concerns, safety of physical and financial assets are expected to fuel Kuwait's Access Control market. Further, card reader access control systems accounted for majority of market share and witnessed maximum revenue share from commercial offices and government & transportation verticals. According to 6Wresearch, Kuwait access control market is expected to grow at a CAGR of over 7% during 2015-21. Apart from dominance of card readers in the overall access control market, biometric is emerging as a potential market in Kuwait; fingerprint modality based biometric access control systems are already in growing demand, derived from commercial offices segment. Kuwait's growing construction market has played influential role in shaping Kuwait access control market. Kuwait Development Plan for 2015-20, which aims to spend around $7 billion on construction of Kuwait Metro, construction of 45,000 housing units along with new Railway Network, and mega oil projects, would further drive the market for access control systems in the country. The report thoroughly covers the market by access control types, verticals, and regions. The report provides unbiased and detailed analysis of the on-going trends, opportunities/ high growth areas, market drivers, which would help stakeholders to device and align market strategies according to the current and future market dynamics. 13.1	Bosch Security Systems, Inc.
13.4	Lenel Systems International Inc.
Kuwait is one of the prime growing economies amongst GCC countries. On account of growing construction market, along with rising security concerns, Kuwait witnessed sharp increase in deployment of various electronic security systems. Electronic security systems mainly consist of Video Surveillance, Access Control and Intrusion Detection Systems (IDS), where in Kuwait, video surveillance segment generated majority of the market demand. Access control systems on the contrary is emerging as a potential market in Kuwait, attributed to construction of three new cities- Silk City (Madinat Al-Hareer), Sabah Al Ahmad and Al Khiran Pearl City. 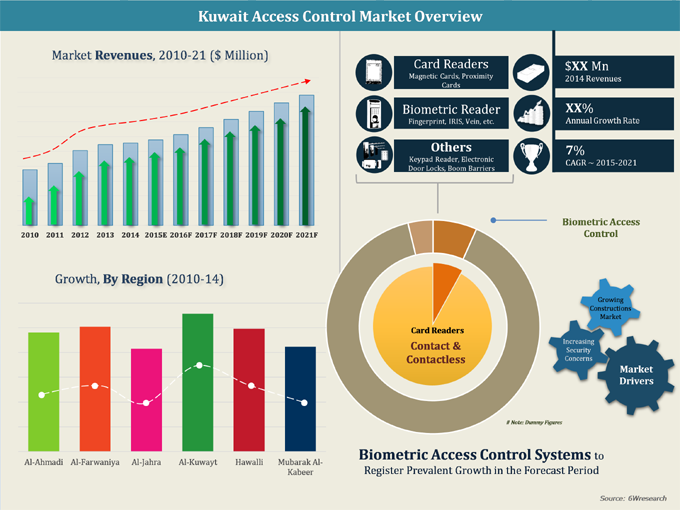 Kuwait's access control market mainly comprises of card and biometric access control systems, wherein card access control systems held majority of the market share. Biometric access control is one of the fastest growing segments in the overall access control market of Kuwait, where fingerprint modality based access control readers accounted for prevalent demand in 2014 and is further anticipated to dominate the overall sales over the next six years. Majority of the demand for access control systems has been generated from commercial office vertical. Major companies in Kuwait's access control market include- Bosch Security Systems, FingerTec, Honeywell, Lenel Systems and Morpho (Safran).